This mom (thumbs pointing at myself) has got to admit something....I would feel like mom SPECTACULAR if I actually did something as organized and clear as a collection bin. Here is how it actually goes down in my house. First I should tell you the ages of my children. They are approximately 7, 5, 3 and 1. My oldest, my son is great about helping and very rarely leaves a mess for me or anybody else. He is my go to guy for cleaning or any kind of help. The five year old daughter has a lovely habit of packing up all her special stuff, loading it in a stroller and then unpacking it in the living room. She can be very helpful IF she wants to or with a good bribe. She keeps her own things rather neat. My three year old is like a small, curly haired Tasmanian devil (and I mean that in the NICEST way possible.) She is easier to understand than a Tasmanian devil but actually enjoys yelling "NNNNOOOOOOO!!!!!" more than the creature. The one year old is officially in the mess making stage and despite the fact that I SHOULD be a seasoned and organized mother at this point with latches on all the cabinets, alas, I am not. She throws stuff on the floor now too. Then there is me. (I am not even going to APPROACH the mess making habits of my fabulous husband. I am currently focusing on the thousand things he does right.) I am not that organized. I don't really enjoy cleaning. I (gasp) could easily spend too much time on the Internet blogging. I do make a serious effort NOT to do this too much but I do occasionally fail. So, if you throw it all together in a little tile floored pot you get....one H- E- Double Hockey Sticks of a MESS. Enter the chore box where you take toys if they leave their crap around. I would high five myself if I got my crap together enough to actually do something like that, make it, announce it and then follow through. I think I might actually nominate myself as mom of the stinking year. But no, the toy stealing box is decidedly NOT how I handle the constant flux of mess that is my house. Sometimes I ask the kids to get their stuff. Sometimes I even "clean with them." (Side note- I see this suggested all the time on blogs about peaceful parenting. Does cleaning with your kids actually work for anybody?! Either my kids are totally dysfunctional or I am doing something horribly wrong- or both- but it does not work for ME. It usually ends up with me cleaning, them chatting and me getting more and more annoyed as they get distracted and don't pitch in. Maybe I should learn that song from Barney. That MUST BE THE MISSING LINK! "Clean up, Clean Up, Everybody everywhere!" BLECH!!!!) Anyway. Needless to say, my attempts and cleaning with the kids usually end very poorly. Then, rather than gently placing their toys in a box and allowing them the privilege of earning them back with another chore, I go nutso. I grab a....TRASH BAG...and I gather up stuff and then- I THROW IT OUT. If it is good enough I donate it to charity. If it is crap, I throw it away. If you are wondering if this is traumatic, then you may in fact be right. You can even leave a comment about how awful and abusive I am. Really- go ahead. I won't even blame you. I get it. I am crazy. Unfortunately nobody else in my house is on board with my life of freedom from worldly plastic junk. Nobody else cares. And there is the practical consideration. I have four kids in a single bedroom along with all their toys and clothes. Even if kept to a very minimal amount there is a lot of stuff in a small space. It routinely drives me crazy. I have the misfortune of being both disorganized and frazzled by mess. It is a sure recipe for disaster and capital "C" crazy. "I wish I was less crazy like me and more like you. You go GIRL!!! I can't even believe that you took the time to make something like that! I feel good about myself if I mop the floor without screaming at somebody. Holy freak girl, I just realized you managed to write a POEM?! Can we be friends?!" And now, I am going to clean my house. The dread alone is actually numbing. If I was brave I would post a picture of what my house looks like at nine o'clock at night. I will spare you though. Somebody tell me I am not the only one who is simply glad to survive some days. Seriously refreshing. I'll join you in the Mormon-Monk life. Our children can swim around in their sea of toys without us, I suppose. They'll surely grow up normal then, right? I have a rule in my house that children are not allowed to look in the garbage can, because if they do they inevitably see something I have thrown out and then there's not just toy mess around, but toy mess covered in smushed banana, moldy bread and wilted lettuce. If I didn't know any better, I would have swore this was written by me. While I CAN see TPLT's pov on this, I do have to respectfully disagree, myself. But hey, to each their own. No one needs to be made to feel like they are somehow less of a crunchy/gentle/peaceful parent if they utilize something like this. I mean, at least they're not taking a switch to their child's backside for leaving it out, right? I thought the same thing about the box, "who has time for that?!" Mine are 9, 8, 5, 3 and 6 mos and we have a small house. So I feel your pain. One particular child has trouble with stuff and it multiplying. So one day we cleared his room. everything. gone. I packed his special items, and threw a ton away. He just cant handle it. A few things have crept back in but goodness me if he isnt much better at cleaning up! It actually worked! You do what works for you mama. All the "I never yell at my children that will scar them for life" mamas can hold their hands and do it their way. I'm pretty sure you were channeling me that whole blog. But you weren't. Which means that neither of us are alone on this journey called motherhood. i too become completely overwhelmed with the sheer magnitude of STUFF we have in our house. sometimes i just want to box it all up and throw it all out (or donate it). i go crazy on how to be a good mother. i have fought with myself, do i clean up the mess because it bugs me and no one else seems to give a hoot... OR do i demand help as we live in the house together and it is a community living area and every one should feel comfortable in it, even MOM! i shouldn't have to kill myself tripping over stuffed things of break my feet on about a billion legos. then again.. if they don't care why do i? BUT then again they need to take care of their things because it is wasteful to just leave stuff around to get broken. Do you have a hidden camera in my house, and my mind for that matter?? You could not have described me and my children (even very close in ages) any better.. to a T. Except I don't really throw away their stuff, I keep it in the garbage bag in the basement for a while until they somehow get into it and sneak everything back into their room. I have to agree... as parents, it's our job to give our kids incentives to take care of their belongings and surroundings. And how often do we find ourselves trying to teach them lessons, and think, If I only took my own advice, Heavenly Father could help ME with this, too! You are quite brilliant: don't ever stop telling the truth about motherhood; you are a beacon of (in)sanity in the increasingly bullying world of parenting blogs. I've stopped reading all that peaceful parenting crap because they simply do not reflect reality - everyone has the right to parent in their own way, it's often damn hard and thankless so you just have to do whatever works for you: as long as children know that they are always loved they'll be fine. There are days when our whole house seems like a giant trash can of kids junk because I haven't got the energy to deal with it all the time, and then like you I have a flip-out and have to get some space to breathe!! I encourage my girls to tidy up and I'll help, but it can often end up with me yelling! Kids have to understand how they affect their immediate environment otherwise there's no hope for them as adults and their impact on a wider scale. I'm a big fan of the "put it away or I'll throw it out" style of parenting. Though I must confess I mostly chicken out and hide it somewhere, then end up giving it back to them when they've done something super cute or clever. Stupid I know, they've got me all figured out. Oh, you're definitely not alone :) I don't know if I can even click over to the other site because it might just make me angry. I sort of feel like all the stuff they have is a privilege and not a right. If they don't take care of the things they've been gifted or allowed to have, there are repercussions, just like in all of life. One of those repercussions is mom going ninja-crazy and throwing out things that are not serving our family. I would rather my children learn respect for the other people in the family and a proper detachment from things than have momentary happiness in their STUFF. LOVE this post! While I don't usually go as "crazy" on them, I have definitely been known to grab a garbage bag and nonchalantly throw things away. I love the bin idea...but alas, it's not me either. I did creatively come up with a new way to inspire them to clean up. Give them a laundry basket to fill up with their stuff and put away and make a contest out of it. I have to admit that the only reason that I dreamed up such a "game" was because my 36 week belly won't allow me to bend over and pick anything up anymore, LOL. We all do what we can in this adventure called motherhood, right? Such a great post! I really feel like I could have written it myself - especially the part about being a monk! I've thought the box was a "good idea" in a sense - I think kids need to LEARN to take care of their things. If it's been a habitual problem then the box becomes a good learning tool, followed by grace when it becomes a rare occurrence for stuff to be left out. 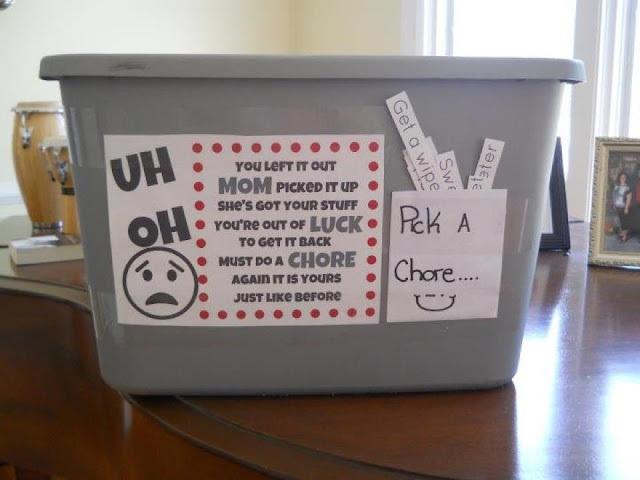 I WILL agree that this teaches kids that chores are punishments. I heard of a mom doing something similar and her kids had to fork over their allowance money to get it back (and subsequently could do more chores to earn more allowance). I think this teaches REAL life skills. Leave your car in the wrong parking lot? You are going to have to pay to get it back from the towing company, and you may have work more hours to afford to do that! Yea I've done the trash bag thing, I didnt realize it was a big deal or that I was crazy. (I wonder what else qualifies me as crazy that I am unaware of? Lol) Our thinking being: if our kids value their things, they'll take care of them. If they don't want to, someone else will. If they would rather see it disappear to the garbage or some other kids toy box than pick it up and move it 5 feet to the place it belongs, then they don't really care about it and won't miss it. I actually wish I threw out MORE, but some toys I'm attached to and don't wanna chunk it. I also do not agree with the original article. My job, as a parent, is to make sure their needs are covered: food, shelter, clothing, love, security. I personally believe (and have observed in my kids) that they feel more loved and feel more secure when there are boundaries. Those boundaries include what is and is not acceptable when it comes to their belongings. My kids continuously left their toys (I.e. useless plastic crap) all over my small house in the living spaces and refused to pick it up. About a week ago I culled everything that didn't have some learning value. They have blocks, Legos, dress-up items, and books. Everything else went into garbage bags while they were watching. Not only did they not complain, they pitched in to help. For the last week, they have been happier, actually played with the toys that require imagination and creativity, spent more time outside, and have fought less. By focusing so much attention on respecting their belongings, I lost focus of paying attention to their needs. They NEEDED me to set those boundaries and are happier for it. They seemed to get overrwhelmed by all this stuff too. The bagged up toys are going to the thrift store in the next few days and we are all happy to see it go. I think the author of this blog has kinda got it wrong here by focusing too heavily on the belongings. We ALL lose possessions for all kinds of reasons. Things get (truely) stolen, lost, broken, burned in a house fire, etc. so they need to learn how to deal with losing things for whatever reason. And afterall it IS just stuff. Oh, I SO have to agree with you! I read the other article, and just can't agree with it, either. Although, hat's off to Mamma of Four, who makes the point that we're all different, and what works for one family doesn't work for all. Heck, what works for one child might not work for another one in the same family! I think TPLT misses the point that this is a learning tool. Kids don't come out automatically knowing the rules. Not all kids are easy learners. And as someone else mentioned, the rest of life is harsh. That doesn't mean we have to be harsh with our children, it means we have to lovingly show them how it works, while they are in the safe environment of their home and family. You see that person violently swearing at the tow truck receptionist because they towed her car? That person never learned to be responsible for her own stuff. It's always someone else's problem. So I say, use the bin if you've got kids who need it. It doesn't take them long to figure it out. And if it brings a little more peace into your household, even better. My husband will be happy to know that not everyone else is perfect like he weirdly thinks. I can't believe there was an argument about this box not being "peaceful" enough. Does the paper say "if you want it back, please kindly line up for your beating"? No. People get way too extreme with their arguments. I swear they just do it to feel vindicated. Not because it actually makes any sense at all. This is a very peaceful way to discipline if you ask me. It's the love and logic way (not that I think that all of love and logic is good). Maybe we should just ask Stephan Molyneux. His parenting style has made the very most sense out of everyone's. His is more philosophical/peaceful parenting. Thank you ALL for responding! You give me hope. I am currently bagging up stuff as I write and it is LIBERATING and they are helping. And thank you to TPLT who responded. And the more I think about this, it IS about respecting my children. I respect them enough to pick up on this lesson and put the lesson into practice. They aren't delicate little flowers that will be shattered by having their toys taken away. They are intelligent and strong little people that are absolutely capable of handling this rather minimal discipline. I am probably equally crazed by stuff or slamming doors. My boys lost their bedroom door a couple weeks ago and are on the verge of loosing their toys. My plan is to pack them up and put them in my office/craft room and they can check out a few everyday, that must be returned at the end of the day. I am so tired of the mess...they don't miss the toys I have taken away nor the ones donated to a friends recent garage sale. you aren't alone, I could have written this. I ignore the mess until I can't stand it any longer, then freak out, then get the trash bag. And get mad at everyone that gives them crap we have no room for. Oh hell YES. I have been silently reading all the threads on FB that started out like, what a great idea this is! and then dissolved into - if your kids aren't RESPECTING their toys and cleaning up ALONG with you because you are a part of the SAME TEAM, then you are doing it wrong. I did not have the time or the energy for the head explosion that was about to ensue. I had to click, click, click away. Listen, if other people's children all peacefully and happily pick up because their parents have perfectly modeled such behavior and would never *think* of taking a toy from their child, then more power to them. But I? Am not harming, abusing or traumatizing my child by taking their crap away if they don't pick it up. Do not equate the toy hostage box to hostile parenting. For the LOVE. I like the idea of the box, but it would be counterproductive in my home as I make my 6 yr old do daily chores and she must clean her room twice a week. One way we battle her over load of toys is we go through them several times a year and either throw it away or donate it if it nice. I do this with her clothes as well just to manage the pile of ever growing clothing. I have to laugh at the "mommy war" bullcrap started over this dumb bin. If this chick's house is organized enough that a single toy left out makes a difference, then she's doing something freakin' right, IMO. I do the "ninja trashbag freak out" too, btw. Yup you read my mind. Our problem is clothes though, years and years of clothes. Ladies, have I told you lately that I love ya? Ohhh I love this post so so so so so so much. I usually skip ahead to psycho mom and freak out!! Ohhhh well! I can't be organized about anything, especially my kids leftovers!!! You are like my mom. She would give me the choice. I clean it or she would. If she did it involved a trash bag too! I am now almost 30 and I still love her. You aren't crazy! I agree with you on cleaning with your children thing. The same scenario always happens to me and I end up a screaming, ranting lunatic (my kids are the same age as yours minus the 5 yr old). I have to admit I like neatness though it doesn't happen often. I can be militant with them picking up after themselves but my 13 year old has issues with cleaning up which is why, when I decided I had to organise and clean her room properly because her 7 year old sister who shares her room deserves a clean room too, I was a little shell shocked to discover mouldy orange peels and a horrible mess of papers, jewelry and everything I can even think of. I believe in peaceful and gentle parenting but it doesn't always happen that way. I was one of the ones who posted about it being too punitive for my taste but I'm not one of those perfect, balanced moms who can actually implement the whole non-violent communication thing. Instead I'm some sort of weird dysfunctional hybrid who doesn't want to force my kids to do chores, but does eventually throw out or give away toys when there get to be too many. So I feel for you but wanted to point out that modeling respect is the best way to teach it, and throwing away other people's stuff is not respectful. (Taking back gifts used to be called Indian giving until the Indians ppinted out they only took back gifts that were not respected). The main principals of non-violent communication are that all actions are motivated by attempting to meet a need and that negative feelings are a result of unmet needs. One more is that we, as adults, are responsible for meeting our own needs. The need for order is one of the main ones addressed here, along with the needs for understanding and ease. When disorder is overwhelming you might feel angry, tired, overwhelmed and frustrated all at once. Setting up a syatem is one way. Are there others? I get that Unknown but sometimes I think that people place all the respect burden on themselves, yet expect none FROM their children. This is a two way street. If children (or parents) are making a house unlivable and don't care that it is harming those around them but mom does nothing out of concern for her child feeling respected, what is she really teaching them? I have found that as the children have multiplied I see the need for MY being respected more and more. Not only that our HOME should be respected. The children are not the only people in need of respect. And frankly, not all kids will learn from simple "modeling" of behavior. Tried. Failed. I personally agree more with TPLT, but I don't see this as one of those clear cut issues of good parenting/bad parenting. We are not talking about spanking, or anything like that. Do I think this is the ideal way to deal with toys left out? No, but I don't think it is terrible, either. Being a parent is hard, and if this is working out for you, I'm not going to tell you to stop. I think you are my long lost new BFF ;) wanna come over and we can "freak out like a ninja "together? I love it. Great writing. So true. It brings me joy to think of living in an empty room too... a girl can dream right?!! You must live at my house. lol Thanks for sharing again Sarah. I think I go through the same steps but often the ninja approach rears its head. Oh yeah, I do the freak out ninja thing too. AND I so agree about cleaning toys "with" your kids. Works well when they are under 4, but as they grow older that just doesn't seem to work. Just frustrates me. I need to make a box like that. Wouldn't take too much work. Just copy her poem and I am on my way! Lol, I feel like this and I only have TWO! Are you peeking through my windows? We also have a small house and very few spaces to actually put things. So we will get it all clean and then its up in smoke by then end of the night because my 3 year old feels the need to tear out anything in her line of vision. I totally freaked out like a ninja on my kids room today! It now looks amazing and smells like lavender. I might have to sleep in there tonight because the laundry pile on my bed is so big there is no room for me. Did you like, spy on me and write a post about MY house?! We have a Garbage Faerie. Her name is "Momma". The Garbage Faerie attacks without warning but only things that are left on the floor. My kids don't think it's cute of funny. Now, as far as "cleaning with them" goes, yes, this works. But only because I'm a drill sergeant. Ok but seriously, "cleaning with them" in my house means everyone, including me, is doing chores. My chores, aside from handing out step by step instructions like a boss are done while everyone else is doing theirs. Example dialogue: "Abby, you're doing trash, pick up the papers and throw them away. Ethan, honey, put that car *back* in the box, it's pickup time. Ariel, put the cat DOWN, the living room is NOT upstairs, get back down here and gather up the dishes from the living room like I said. Morgan, stop arguing with me and complaining and just pick the dolls up, thank you.